This two-part blog post is by Jen Munch, former intern in The Phillips Collection’s Conservation department and current Graduate Fellow in Art Conservation at SUNY Buffalo State. Read Part I here. Later renovations and expansions required the sculpture’s deinstallation and relocation. During one deinstallation in 1987, the heavy stone sculpture was damaged at two locations along the slab’s bottom edge, where small sections of the stone were chipped away. In 1989, conservators repaired the sculpture by filling the two losses with chips of stone from the back of the artwork, plus an epoxy material that matched the colors of the grey and pink slab. Over time, the epoxy’s colors faded to beige, due to the strong sunlight that this artwork is exposed to. 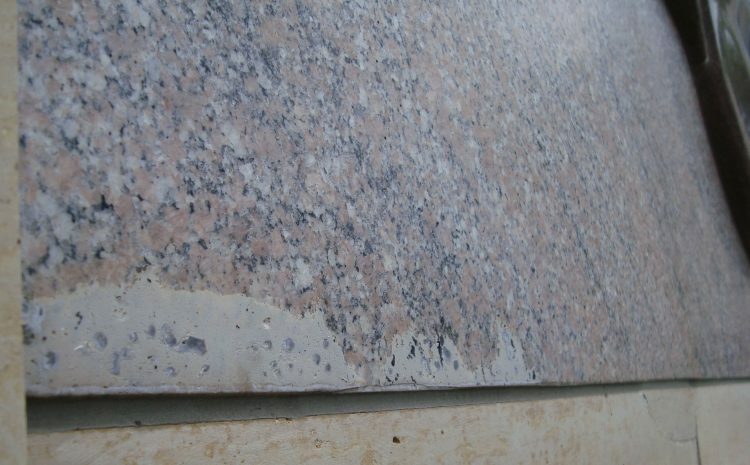 In 2004-5, the faded fills were replaced with new epoxy fills, with the goal of better matching the color of the surrounding stone. By the summer of 2017, the “new” fills again had faded to beige [fig.7, 8]. Figure 7: Before treatment, 2017. The discolored fills are circled. Figure 8: Before treatment, 2017. The discolored fills are circled. The aging effects of sunlight are well known and documented. Just as the sun can damage your skin or the fabric of a sofa placed near a window, the sun’s rays can degrade many pigments. Ultraviolet rays are the most damaging, but visible light will also cause some degree of damage. In 2017, the epoxy fills were still structurally stable but their beige color no longer matched the surrounding stone. The fills were visible and distracting. On one warm August day in 2017 [fig. 9], I spent the afternoon “in-painting” the beige epoxy to make it match the surrounding area. I applied small amounts of special conservation-grade paints atop the epoxy. The paints I used have good aging properties, but they, too, will eventually fade and need to be replaced. The work I did, and the materials I used, are documented with both written reports and photography, taken before and after treatment [fig. 10]. This information will be valuable to the next conservator who has to treat this artwork, just as the reports from the 1989 and 2004-5 treatments were helpful to me. I enjoyed working on this sculpture and getting to learn about its history. It was a pleasant surprise to learn that this beautiful bird was custom-made for the Phillips and is a work of art, not just a logo. 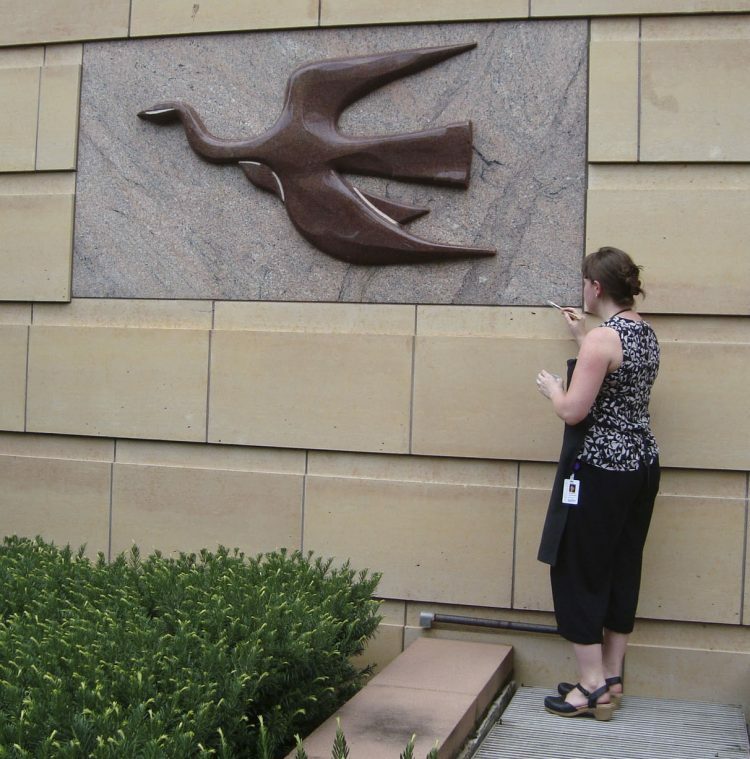 I hope you have enjoyed reading about this artwork, and will look for the bird the next time you visit The Phillips Collection. Figure 10: After treatment, 2017. The epoxy fills have been in-painted to match the stone. 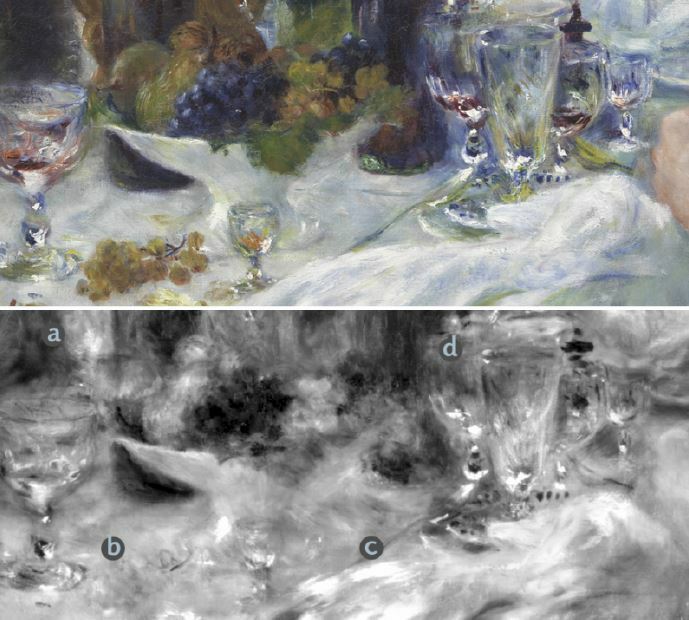 In order to understand how Pierre-August Renoir created Luncheon of the Boating Party, a technical study was conducted in the conservation studio. By closely examining the surface and comparing it to x-radiographic and infrared images, we learn that Renoir made numerous changes both large and small over several months. While he deftly captured the moment of friends casually enjoying an afternoon at a restaurant on the Seine, the in-depth analyisis shows that he labored to capture the immediacy of the scene. Just as he reworked his sitters, Renoir also revised objects on the table. a) A wine glass in front of the cask was painted out. b) An aperitif glass was replaced with a small bunch of grapes. c) Another wineglass in front of the fruit bowl was removed. d) One of the tall glasses on the right was originally a stemmed glass. Although it is possible that tableware changed between painting sessions and Renoir modified his depiction accordingly, these may be deliberate choices he made after the fact or in his studio. Renoir made a critical modification to the composition by adding an awning across the top edge of the picture. Sweeping textured brushstrokes that do not correspond to the awning’s striped fabric are easily visible in the upper left, showing that the landscape and sky initially dominated the top of Luncheon of the Boating Party. Upon close inspection, we can see that the bridge was initially visible in its entirety, along with a dwelling on the far left. The colors used in the foliage—yellow, blue, orange, green, and white—are discernable beneath the thinly painted fabric. The infrared image (left) also indicates that he shifted the placement of the figure. The higher placement of the figure’s hat is seen as a dark shadow above its current position. Sketched lines across his forehead show that Renoir made several adjustments to the format of the hat before settling on its final location.